Taylored Expressions 7th Birthday New Release – Sneak Peek! Hello and welcome to the Taylored Expressions 7th Birthday New Release. Today is the start of the sneak peeks of the new Taylored Expressions new release. I am also excited to say it is the 7th birthday of Taylored Expressions. Yay! Happy Birthday to Taylored Expressions! Wishing Taylor all success now and in future. We are celebrating the birthday with sharing lots of inspiration using new soon to be released goodies and of course there are fabulous giveaways. Woohoo! I will give you details regarding the giveaways towards the end of the post. But first, I have couple of cards to share using the new dies and stamp set to be released on Thursday 3rd September. This is my first card. I have used Presents Cutting plate to die cut using Lollipop cardstock twice. Then the backing for the present using gold foil cardstock. I trimmed the second Presents off the frame.. I also die cut Skinny Mini Party Borders die using gold foil cardstock and adhered at the back of the Presents die cut. I then adhered this die cut on the Shimmery White card front using foam adhesives. Now I added the second smaller presents stack next to the original using foam adhesives. The sentiment is from One & Only You stamp set. Simple yet makes an impact using the contrasting colours. My second card is a shaker card. For this card, I die cut the Presents Cutting Plate using the new Mint Julep cardstock and the backing of the presents are from Lollipop cardstock. 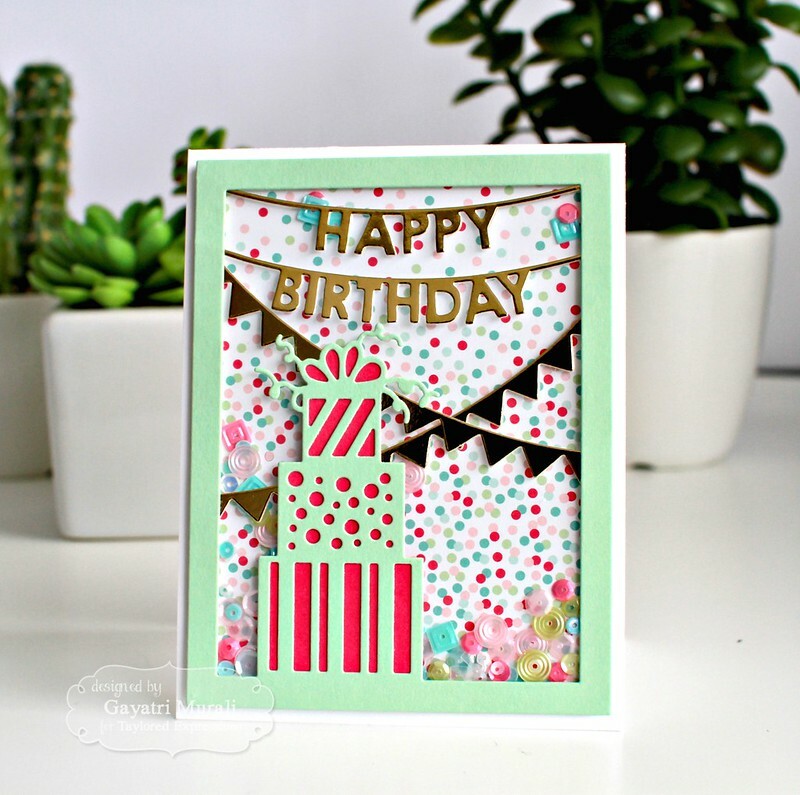 The banners are die cut using the new Skinny Mini Party Borders and Happy Birthday Banner dies using gold foil cardstock. I adhered them to the back of the Presents Cutting Plate facing down so the banners are facing the right side with the cutting plate. Hope I make sense! Then I adhered an acetate panel to seal the frame. I added Build a Scene: Hello Happiness sequins inside, the foam adhesives around and using the confetti pattern paper from Hello Happiness 6×6 pattern paper trimmed to size to close the shaker box. Love the colours from the pattern paper and the sequins, complemented with the gold on the banners. I simply adhered this shaker box on the Sugar Cube card front. Absolutely love the Presents cutting plate, the Skinny Mini Party Border dies and Happy Birthday Banner dies. I think they make a good collection of dies to have to make a great birthday card whether it is a quick clean and simple card or an shaker card. Now to the fabulous giveaway. Comment to win prizes. One random lucky comment will win fabulous giveaway from Taylored Expressions.Visit Taylored Expressions blog for details. Also visit Keia-Shipp Smith’s Blog and Shannon’s Blog for more projects using new release products. All the new goodies will be released on Thursday 3rd of September. I have list all the products I have used on my cards today below for you. 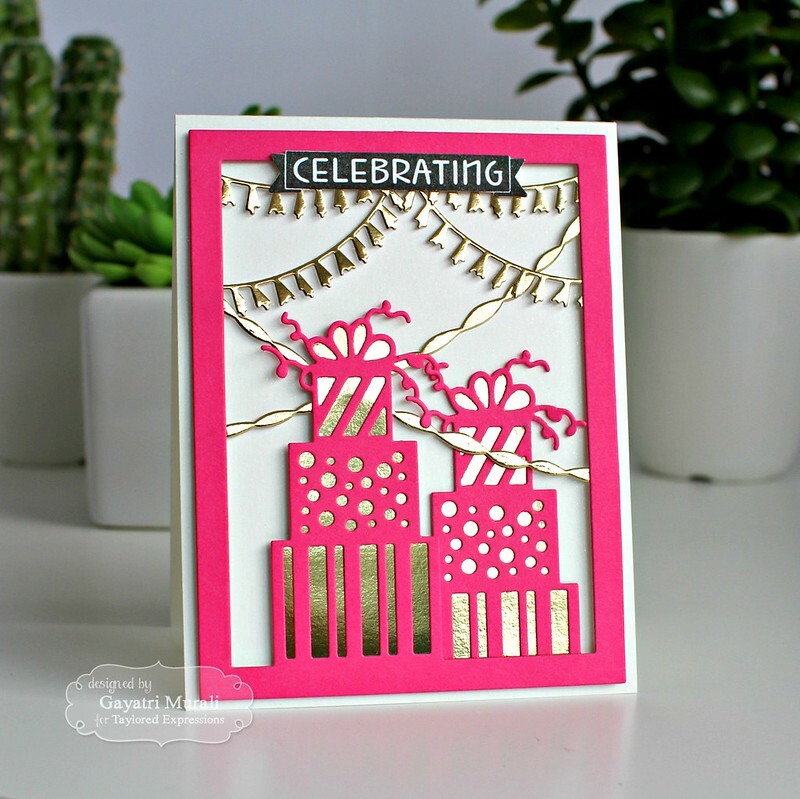 Love the gift box die and your streamers in gold look gorgeous. Great cards. Love the look of these great new dies. beautiful cards Gayatri!! love that you have used gold to die cut!! Love the way you used the garlands! Adorable cards! I need some sequins ! !